“Amici,” when translated from the Italian, means “friends”. It may be a simple concept, but that idea is at the core of what the Toronto-based Amici Chamber Ensemble does – and has been doing for the last 30 years. Part of this mandate has come from making a virtue of necessity. Amici’s core ensemble formation is a clarinet-cello-piano trio, made up of clarinetist Joaquin Valdepeñas, cellist David Hetherington and pianist Serouj Kradjian. There’s a sizeable library of classical repertoire for this instrument combination – but it’s far less common than the standard piano trio (which swaps out the clarinet for a violin). As a result, a lot of the clarinet-cello-piano music that exists tends to get performed by ad-hoc groups, or by subsets of larger mixed instrumental ensembles. Amici follows this pattern, performing repertoire written specifically for their instrument combination alongside works for larger forces. What that translates to, in their case, is a frequent need for guest artists – and lots of them. Their upcoming concert on April 27 at Koerner Hall in Toronto is no exception. Titled “A Legacy of Inspiration,” the show celebrates both Amici’s 30th anniversary and the centenary of Bernstein’s birth, with several works by Bernstein, the Brahms Clarinet Quintet, and Beethoven’s “Rondino” for wind octet. 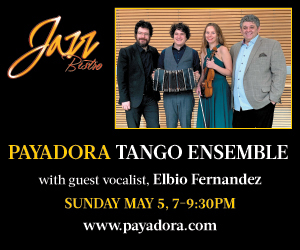 * Joining the trio onstage will be soprano Isabel Bayrakdarian and violinist Yehonatan Berick, along with several wind players from the Toronto Symphony Orchestra. He’s speaking from experience. A relatively recent addition to the group, Kradjian himself joined the trio to replace founding pianist Patricia Parr in 2008. Looking at the ensemble’s work over the years, it’s clear how each trio member’s own musical connections within the local community have helped the ensemble survive. In addition to the Amici’s previous post in the late 80s and early 90s as trio-in-residence at the University of Toronto Faculty of Music, both Valdepeñas and Hetherington play in the Toronto Symphony Orchestra, and teach at the Royal Conservatory. The guest artists that Amici has performed with have often come from the same ranks. As the ensemble enters its 31st year, Kradjian expects it to continue developing its mandate for outreach and collaboration. “We do all of these amazing concerts right now – but we only do them once,” Kradjian says. “We’d love to repeat one or two of them in other areas in the GTA and Ontario. We’d also like to continue making new recordings and doing co-productions. Getting together with other arts organizations in the city – and not necessarily just music organizations. Combining different aspects of the arts is part of what we’re looking ahead to. Amici Chamber Ensemble presents its final concert of the 2017/18 season, “A Legacy of Inspiration,” on April 27 at 8pm, in Koerner Hall, Toronto. *4/13/2018: Since time of writing, a revised concert program has been announced. The concert program now includes works by Bernstein alongside a selection by winners of The Glenn Gould School Chamber Music Competition, Ottorino Respighi's Il tramonto, for voice and string quartet, P. 101, and Ernö Dohnányi's Sextet in C Major, op. 3.